China has tested a new version of a long-range missile that can hold 10 nuclear warheads, according to a report on Tuesday. The test of the DF-5C missile was conducted earlier this month, using 10 multiple independently targetable reentry vehicles (MIRV), the Free Beacon reported. They were inert. Two officials familiar with China’s missile test said it was fired at the Taiyuan Space Launch Center in central China and flew into the “western Chinese desert,” according to the Washington Free Beacon, which has reported on a number of China’s missile tests. As the paper noted, the test is significant because it suggests that the Chinese regime is increasing the number of warheads in its military. Experts say China has around 250 nuclear warheads. Pentagon spokesman Cmdr. Gary Ross issued a statement on the test. “The [Defense Department] routinely monitors Chinese military developments and accounts for PLA capabilities in our defense plans,” Ross was quoted by the paper as saying. The new chief of the U.S. Strategic Command, Air Force Gen. John Hyten, said he is worried about China’s burgeoning nuclear weapons arsenal. “I am fully aware that China continues to modernize its nuclear missile force and is striving for a secure second-strike capability,” Hyten told the Senate Armed Services Committee in September. “Although it continues to profess a ‘no first use’ doctrine, China is re-engineering its long-range ballistic missiles to carry multiple nuclear warheads and continues to develop and test hyper-glide vehicle technologies,” Hyten added. The DF-5C, or the Dongfeng 5, has an estimated range of about 7,500 to 9,300 miles. The missile is slated to be replaced by the DF-41 ICBM, which China tested in April of last year. 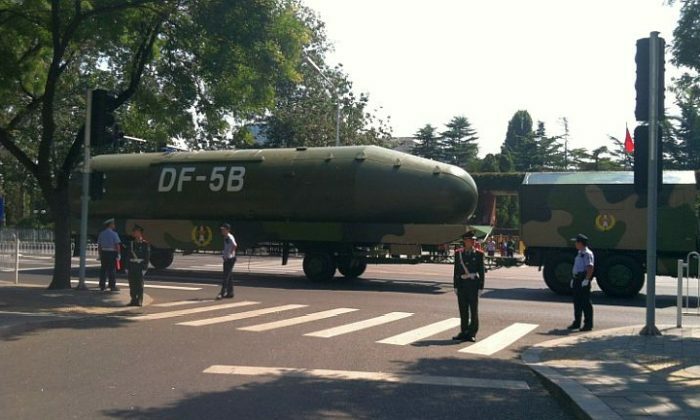 According to IHS Jane’s Defence Weekly, the parade preparations offered glimpses on new missiles such as the Dong Feng (DF, East Wind) DF-15B short-range ballistic missile (SRBM), the DF-16 medium-range ballistic missile (MRBM), the DF-21C MRBM, the warhead section of the DF-5B intercontinental ballistic missile (ICBM), the DF-31 A ICBM, the DF-10 land-attack cruise missile (LACM) and the DF-26 intermediate range ballistic missile (IRBM) – dubbed the “Guam killer” missile.